The casino gaming industry has never been stronger in Southwest Louisiana with each of the four area casino properties having plans for improvements and enhancements. Boyd Gaming Corporation announced a $45 million expansion of Delta Downs Racetrack Casino & Hotel in Vinton, La., slated for completion at the end of 2016. The centerpiece of the project is a new hotel tower, featuring 167 additional guest rooms and suites, and Boyd Gaming also plans to redesign all 200 existing rooms at the property, providing a fresh new look. The property will also redesign its food and beverage facilities, as well as expand its special events center to better accommodate meeting and banquet functions. The newest casino in the area, Golden Nugget Lake Charles, which opened in December 2014, is adding a 300-room hotel tower to the resort by the end of 2016, bringing the resort’s room count to 1,040 rooms. Each of the additional rooms will be over 500 square feet and will contain a five-fixture bathroom with two sinks, walk-in shower, oversized tub and a separate toilet. Currently, the 25-story hotel and casino features 740 luxury rooms and suites, a 30,000 square foot gaming floor with 1,600 of the newest slot machines, 70 table games, and six live action tables in the poker room, and a world class spa. The property also offers 12 renowned restaurants and eight boutiques and gift shops. This past April, the casino opened The Country Club at the Golden Nugget golf course. This golf course is an 18-hole, par 72 golf course designed by the award winning Todd Eckinrode and Origins Golf Design. Located right on the bayou, the course has Miniverde greens and Celebration tees, fairways and roughs. The most unique feature is the 15+ acres of waste bunkers. The contrast of the bayou, bunkers and greens make this a must play for visitors of all levels. Located adjacent to the Golden Nugget Lake Charles, L’Auberge Casino Resort Lake Charles has also had a significant amount of renovations and expansions. In August 2014, L’Auberge completed a $20-million renovation of property suites with sophisticated décor, state of the art technology and indulgent bathrooms. The five-star amenities include multiple oversized LED flat panel televisions per suite, luxury bedding, iPod docking stations, televisions integrated in bathroom mirrors, rain showers, Keurig brand coffee machines and more. In late 2014 the property unveiled two new retail outlets, a new restaurant and completed the expansion of Asia. The 26-story casino resort also offers 1,000 casually elegant rooms and luxury suites, 30,000 square feet of non-stop Vegas-style gaming with 1,600 slot machines, 83 table games, and seven live poker tables, an 18-hole championship Tom Fazio course (Contraband Bayou Golf Club®), eight innovative restaurants and 10 uniquely sophisticated shops and boutiques. The Isle of Capri Casino Hotel Lake Charles completed a $15 million tower hotel milestone renovation in August 2013. The remodel, which began in March 2012, includes nine Parlor Suites, 240 Junior Suites, the hotel lobby, the Lakeside Ballroom, the VIP Platinum Lounge and fitness center. Additionally, the property introduced the new Farmer’s Pick Buffet in January 2015. All of these improvements help to make Southwest Louisiana the premier casino resort destination of the South. 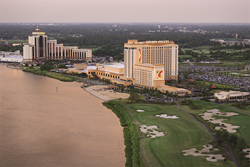 For more information on Southwest Louisiana’s casino properties, visit http://www.VisitLakeCharles.org/Gaming.